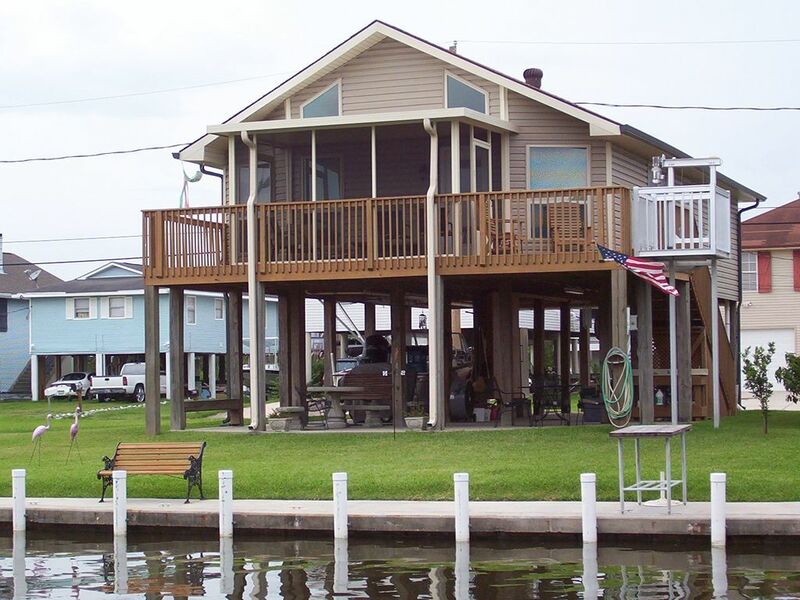 This waterfront property is the perfect vacation rental for those that want all the comforts of home and a relaxing environment after a day of activity in the greater New Orleans area. The home has 3 bedrooms, 2 full bath, kitchen, living and dining room. Wifi internet as well as cable TV. Upper deck has screen porch with cushion chairs and open sun deck. Lower area is perfect for relaxation with a soft breeze blowing. It has a sink with hot/cold water, patio table/chairs, swing, gas grill, fish fryer and seafood boiler. Concrete dock has boat tie-ups, fish cleaning table and park bench for resting while dock fishing/crabbing. Launch your boat at Joe's Landing Marina 1 mile away. We are the 7th canal from Joe's Landing Marina. Charter Guide Fishing: The Island of Barataria is known for spectacular fresh/salt water fishing. Charter guide fishing and other water sports include boating and skiing. Rojas Charters is an excellent source for guide fishing . Jean Lafitte National Historical Park and Preserve: Just 13 miles from your vacation home is the Jean Lafitte National Historical Park and Preserve. Take a walk on one of several nature trails, visit the welcome center and watch free movies, rent a canoe or book a guided excursion down twin canals. Also, nearby is available guided swamp tours and air boat excursions. My wife and I grew up in North Carolina and have lived in New Orleans since 1980. We continue to enjoy our journey through life having been married for 47 wonderful years. Our son is married and lives in London, England. North Carolina is the home of our daughter, son-in-law and our two granddaughters. We enjoy working with real-estate, traveling, hunting and fishing. Deborah Ann was purchased with the intent to update and re-sale. But within a few days, we fell in love with the location and decided to keep it for ourselves and intermittently share it with others. Thanks to those that utilize VRBO, Homeaway, Rojas Fishing Charters and other locals, it has become a 'home away from home' for us and others. Located on the Isle of Barataria, Deborah Ann offers all the comforts of home and is a perfect get-away place to experience southern living on the bayou however you want to spend it. Peace and tranquility for rest and relaxation, fishing, golfing, sightseeing, meetings and conferences, sports events, festivals or just a vacation to the New Orleans area. You will enjoy the comfort of a 'home' - not a hotel room!! Very nice and clean property. Will definitely stay again since Im local to the area. Owners reached out and was very easy to talk to. They have the magic touch to make you feel comfortable in verbal contact and staying behind their door. Beautiful property with all amenities. Quiet, roomy and away from the city in a nice bayou setting. We couldnt have asked for a better stay! Thank you! The grandkids fish with their grandfather in front of the rental. Very clean and organized. Nice to have everything we needed there. Close to New Orleans and will rebook again. Very nice. Great rental!!! This home is very well appointed and everything you could need was provided. Clean, neat and super livable. The location on the canal is perfect - son was fishing every morning and evening. New Orleans is a short drive and made it easy to head to the French Quarter for the food, drinks, and people watching! There is a hidden gem of a restaurant in Barataria - Voleo. Home cooking with the best, freshest seafood you can get. The family owned and operated business makes everyone feel welcome! Finally, when you want a swamp tour, we recommend the Louisiana Tour Company. Also very close by. Go ahead and spend a little extra to get the small airboat - it can go places the big boats can’t. Our captain, Rocky, was outstanding. (Be prepared to get a little wet - or soaked!). It was great! All in all, this was one of the best trips we’ve had and highly recommend staying at the Cagle’s place - the Deborah Ann! Very clean and cozy home! We came down for a girls trip to New Orleans and it fit all 7 of us comfortably and the area felt very safe! Neil was a great host and was very easy to get a hold of, would definitely stay in this home again! The island of Barataria offers great fresh and salt water fishing, water sports and is approx. 27 miles from downtown New Orleans. A comfortable rental home for those who wish to relax after a day of fishing, attending sport events, like the annual PGA Golf Zurick Classic, football at the New Orleans Superdome, basketball at the arena or visiting the French Quarter,shopping, Mardi Gras, New Orleans 's Jazz Fest or any other festivals within the greater New Orleans area.